Residents in Washington, Ill., hard-hit by a powerful EF-4 tornado last Sunday, will have just a few remaining opportunities to comb what's left of their properties and salvage items before bulldozers and clean-up crews move in. Access will be granted to residents with identification, their family members and some friends between 9 a.m. and 5 p.m. on Friday and again from 8 a.m. to 5 p.m. on Saturday and Sunday. Access will be prohibited Monday and possibly Tuesday, officials said. "We're stuck. How do we put closure to our life when we were hit just as hard as everyone else and we can't get in to get out our things," frustrated Washington resident Cindy Zimmerman said Thursday. 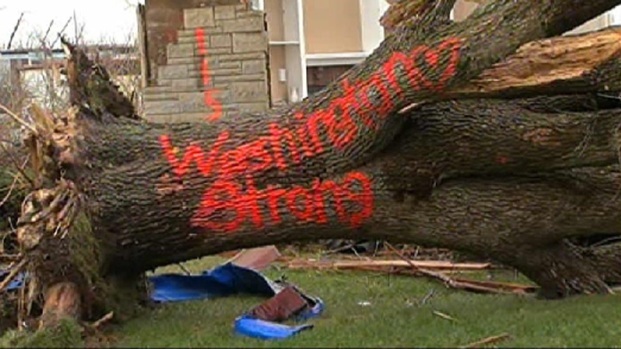 The small community of Washington, Ill., was decimated by a powerful EF-4 tornado last Sunday. One person was killed. Residents were barred access to their homes on Thursday so a pair of Federal Emergency Management Agency teams could assess the damage. Statewide, officials said 1,484 homes were deemed destroyed or uninhabitable. More than 1,000 of those homes were in Washington. Despite that devastation, many of the schools in the small Illinois community reopened Thursday for the first time since the storm. "It's just kind of a re-entry, a first step forward," said James Dunnan, the superintendent of Washington Community High School District 308. "The students and staff that are here I think are grateful to be back in here." Lauren Jiggetts talks to tornado victims still struggling to get back on their feet. Officials said 22 tornadoes raked Illinois on Sunday, killing six people.